The epicentre of the latest earthquake was 83km (52 miles) east of Kathmandu, in a rural area close to the Chinese border. It struck at a depth of 18.5km (11.5 miles), according to the US Geological Survey. 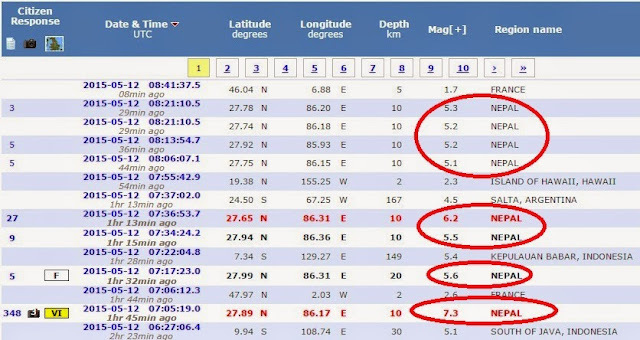 Due to measure earth quake in Nepal at local time 12:45 AM on 12/05/2015 near Namchebajar Epicenter according to American Zoologists it was 7.4 magnitude rector scales. After the Earthquake again many Earthquake was determined which you can see in below image. In this measure Earthquake in Nepal the huge damages were seen in Sindhupalchowk. Dozens of houses were damaged. Today is estimated to have caused most damage on Sidhupalchowk and Dolkha Districts. More houses in Sidhupalchowk were damaged by the quake. headquarters Charikot were destroyed by the quake. Rescue operation is on. Likewise, reporter Dhurba Dangal, who is in Sidhupalchow's headquarter Chautara said that more houses were destroyed in the town. 2 were reported dead and 12 injured in the earthquake in the district.